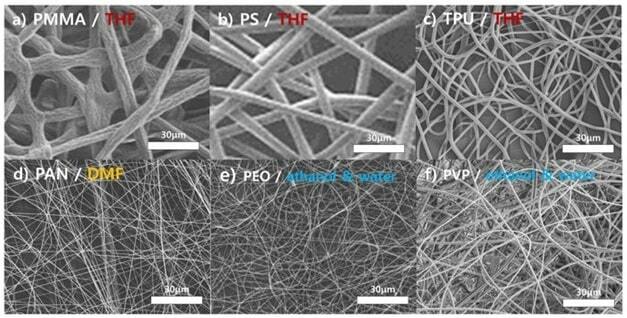 Electrospinning is now a typical way of direct and consecutive nanofibers. In the change of polymers chains in electrospinning falling process, molecular dynamic interaction is proposed after simulation method into electrospinning process.This attempts to apply standard molecular simulation technique to the process of electrospinning is employed to study phenomena involved in the electrospinning of polymer solutions, with particular attention to the formation of Taylor Cone and development of a liquid jet. A molecular base approach allows to to reveal the molecular structure and dynamics, which are accessible to the continuum methods. Keywords: Electrospinning , fluids in electric field, dynamic interaction of polymer reaction, molecular simulation . Natural polymers : Natural polymers include such as collagen, cellulose, silk fibroin, keratin, gelatin and polysaccharides such as chitosan and alginate. Synthetic polymers: Poly lactic acid (PLA), Polycaprolactone (PCL) ,Polyurathene, poly (lactic- co- glycolic acid ) . The polymer chains are connected by covalent bond . The dynamic interactions of polymer chain is applied by initial random perturbations displacement to each particle ejected in from the tip of the syringe . A peculiar conical shape named as Taylor cone affects the shape of the interface of particle to dispose in nanoparticles by the influence of electrostatic forces and surface tension in a particular type of electrodynamic phenomenon. A thin polymer jet is injected by the transformation of liquid surface travel through the syringe connected with oppositely charged electrode , gets elongated by external and internal electric forces. This electrostatic repulsion of polymer counteracts surface tension and migrates to the surface of fiber in the mode of current flow changes from ohmic to convective. The surface tension of liquid polymer is elongated by the force of steam breakup at a critical point when equilibrium state of interaction between electric field and liquid polymer undergo whipping motion loading to the evaporation of solvent. The small fiber produced from electrospinning such as diameter of 1.9nm to 23.0nm having large surface area 10 to 100m square /g and these can be used in diverse application such as including filters, catalyst supports, drug delivery devices and tissue scaffolds. For fundamental necessity of these applications , operational definition of a ‘nanofiber’ exhibits new emergant behavior as the diameter of the fiber is decreased in from microscope to microscopic length scales , typically in the nanometer range. This is due in large part to the requirement that a single nanofiber has to be isolated and manipulated without introducing defects prior to physical or mechanical properties. 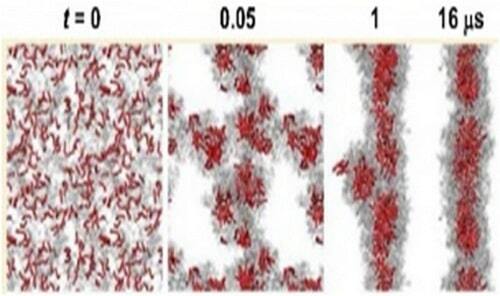 Atomistic computer simulation can be helpful in determining and predicting properties of of individual nanofibers., specially a function of length scales that are comparable to molecular dimensions. The predicted form of dynamic interaction in simulation process is quite different for the two approaches. This difference can be understood in terms of differences in molecular mobility within liquid and between fibers, whether such mobility is appreciable or not. Properties of the solution: Composition, viscosity and surface tension . Ambient conditions: Pressure, temperature, humidity . The nature of the chemical bond of polymer and the strength of the applied electric force. Standard molecular dynamics package, GROMACS (versions 4.5 and 4.6) , is employed to generate classical trajectories. A leap-frog integrator with a typical time step Δt = 0.002 ps is used. LINCS algorithm is employed for constraining bond lengths in a polymer chain, SETTLE is used to constrain water geometry. 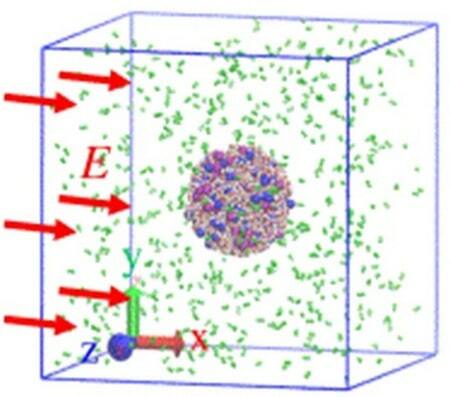 Whenever periodic boundary conditions (PBC) are applied, the particle-mesh Ewald method is used to treat electrostatic forces. Water is represented by a rigid three-site model, SPC, whereas ions and polymer are modeled using GROMOS parameter sets, which adopt a united-atom (UA) approach representing CH3, CH2, and CH groups by single interaction sites. Besides Lennard-Jones and Coulombic forces between sites at different molecules, also intramolecular interactions are incorporated in the case of polymer chain, i.e., bending, proper and improper dihedrals, and third-neighbor interactions. Bond lengths are kept fixed (except for the cases of difficult chain equilibration). Simulations with PEG chains presented here use GROMOS53A6OXY+D force field for all components (water is modeled by SPC, ions are Na+ and Cl–). Simulations herein make use of a solid underlay made of Lennard-Jones sites with positions fixed in a rectangular grid. The underlay serves as a support on which a droplet of the electrospun solution resides. The parameters of the underlay sites have been tuned to maintain a reasonable contact angle of the droplet around 90°. 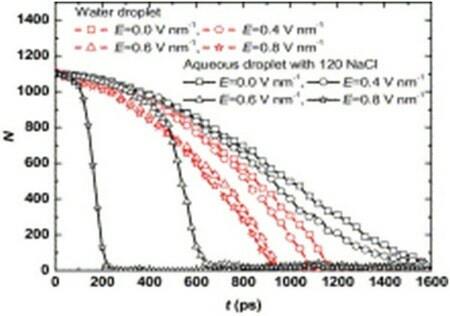 Figure 3: The dynamic interaction between water and molecules at three site rigid model. Composition of the solution is specified in captions; we use hydroxylterminated PEG chains. One can see that the electric field deforms an initially spherical droplet to a conical shape. Further, we observe the change in the conformation of polymer molecules along with deformation of the droplet. Polymer chain uncoils when it is forced to enter the jet, which can be quantitatively monitored using the end-to-end distance (the distance of terminal hydrogens) or the radius of gyration, see Fig. 3 and Fig. 4, respectively. In aqueous solutions, an important characteristic of solvation processes is the number of hydrogen bonds (H-bonds). Fig. 4 shows the development of the mean water–water H-bonds is probably caused mainly by the increasing surface area and the fragmentation of the liquid due to fast evaporation of water or the ejection of accelerated ions surrounded by a water cluster, both of which can be observed when visualizing therajectories (see the rightmost panel of Fig. 2). We used the following H-bond criterion: H–Od∙∙∙Oa angle less than 30°, Od∙∙∙Oa distance less than 0.35 nm (subscripts: d – donor, a – acceptor). Figure 5: The bond lengths of polymer chain in periodic boundary conditions. In the present contribution we use molecular dynamics simulation to investigate the jetting from a droplet of polymer solution. We have observed the formation of a nanoscale analogue of the Taylor cone and the subsequent ejection of the jet. We use PEG chains of two different lengths in aqueous solution containing sodium chloride. We have shown how the conformational structure of the polymer can be monitored. We have also observed that during the initial stages of the process the polymer remains well solvated. Future work will be focused on the following tasks: (i) systematic study on solutions with varying concentrations of components and degrees of polymerization; (ii) averaging trajectories to obtain smooth and representative characteristics of process dynamics; (iii) using different polymers (PVA currently running) and/or solvents (or even solvent mixtures); (iv) simulation of later stages of jetting (solvent evaporation and fiber solidification); (v) upscaling the simulation to approach realistic scales. RAFIEI S. Electrospinning Process: A Comprehensive Review and Update. In HAMRANG A., BALKÖSE D. (Eds.) Applied Methodologies in Research and Technology. Apple Academic Press: Toronto, 2015. HOHMAN M. M., SHIN M., RUTLEDGE G., BRENNER M. P. Electrospinning and Electrically Forced Jets. I. Stability Theory. Physics of Fluids, Vol. 13, No. 8, 2001, pp. 2201-2220. KONG C. S., YOO W. S., JO N. G., KIM H. S. Electrospinning Mechanism for Producing Nanoscale Polymer Fibers. Journal of Macromolecular Science, Part B: Physics, Vol. 49, No. 1, 2010, pp. 122-131. FRENKEL D., SMIT B. Understanding Molecular Simulation: From Algorithms to Applications, 2nd Edition. Academic Press: London, 2002. JIRSÁK J., MOUČKA F., NEZBEDA I. Insight into Electrospinning via Molecular Simulations. Industrial & Engineering Chemistry Research, Vol. 53, No. 19, 2014, pp. 8257-8264.